Bedmi Puri Recipe – a coarse urad dal paste aka pithi is made and added into the dough to make pooris. So it is also known as urad dal puri. 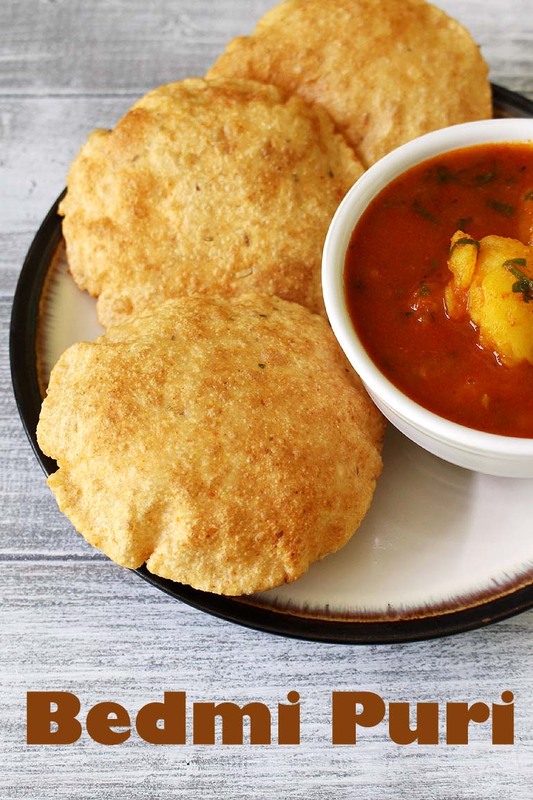 These bedmi puri are served with rasedar aloo ki sabzi as a breakfast or brunch. This combo is called bedmi aloo recipe. This breakfast is popular in Delhi and Uttar Pradesh (specially in Agra, Mathura, Banaras). 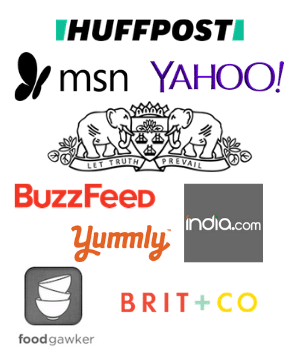 You will find it as a street food there. There are two methods of making bedmi poori. The one is I am sharing where pithi is added to the dough. The second is where pithi is cooked and stuffed into poori like we do for kachori, then it is known as bedmi kachori. As I mentioned, here I have used urad dal. But at many places moong dal is used instead. These bedmi poori have slightly crisp texture that is opposite to regular poori. Addition of sooji helps get crispy texture. Also they are slightly thicker compared to the regular ones. It tastes best when paired with spicy, chatpati aloo sabzi. 1) Wash urad dal under running cold water till water runs clear. Or rinse it 3-4 times and then soak into enough water for 3-4 hours. 2) After soaking it will get double in size. Drain the water completely. 3) Take soaked urad dal into grinder jar. Add fennel seeds, cumin seeds and green chili. 4) Make coarse paste (Not too smooth, not to coarse). If the paste aka pithi is too smooth then it won’t give good texture and taste. If the paste is too coarse then it will not puff up while frying. 5) Take atta, sooji, salt and red chili powder in a bowl. 6) Mix and add prepared paste. 7) Mix thoroughly using your fingertips. 8) Now add little water at a time and keep kneading into the dough. Make smooth yet stiff dough just like poori dough. Cover it and let it rest 20-30 minutes. 9) After that again knead for sometime to make it smooth. Divide into 18 equal portions, make smooth balls and flatten between your palm one by one. 10) Take one flattened disc and roll into 3 ½ inch diameter circle. Roll few puris and keep them in the plate covered. 11) Heat the oil in pan or kadai for deep frying. Oil should be really hot otherwise puri will not puff up. Once hot, slide one puri in. Lightly press in circular motion using slotted spoon. 12) And within sometime it will puff up nicely. 13) Once it gets golden brown and slightly crispy at the bottom, flip it and fry other side. 14) Once ready, remove it to a paper towel lined plate and repeat the same for rest. 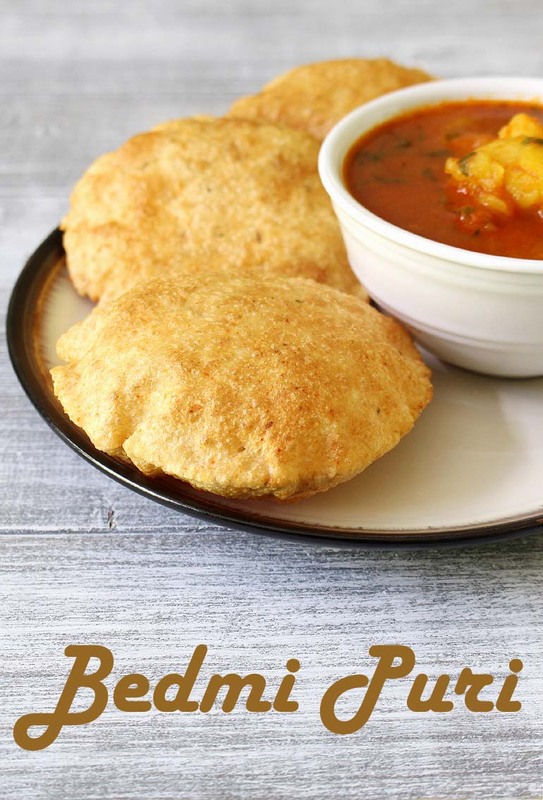 Serving suggestion: Serve bedmi puri with aloo ki sabzi (aka bedmi aloo) as a breakfast or lunch. Wash urad dal and soak in water for 3-4 hours, then drain the water. Take soaked dal into grinder along with cumin seeds, fennel seeds and green chili. Make semi-coarse paste. Keep it aside. Take whole wheat flour, sooji, salt and red chili powder in a bowl and mix. Add prepared paste and mix using your fingertips. Then knead into smooth yet stiff dough by adding little water at a time. Cover it and let it rest for 20-30 minutes. After that again knead to make it smooth and divide into 18 equal portions, make smooth, flattened discs. Work with one disc at a time and roll into 3 ½ inch diameter circle. Once you have few puris rolled, heat the oil in a pan on medium heat for frying. Slide one puri into hot oil, slightly press using slotted spatula so it will puff up. As it gets golden brown and slightly crispy from bottom, flip and fry other side. Once ready remove it to a plate and repeat the same frying process for rest. Shaltry this recipe today ! sure. let me know how it turned out. Beautiful ! Thank you for this tasty dish !